The Raiders are currently scheduled to move to Las Vegas for the 2020 NFL season. You have to say this for the NFL’s Raiders organization…they don’t do anything quietly. 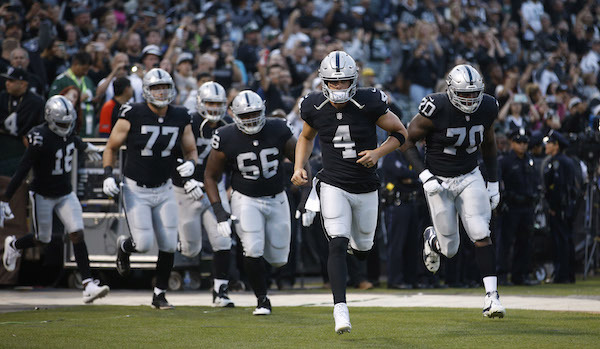 Fresh off trading their best player for relative peanuts to the Chicago Bears, the Oakland Raiders are gearing up for the 2018-2019 regular season, one of their last few remaining here before they move to their new home in Las Vegas. It’s been a bit unclear exactly when the Raiders will shuffle loose the California coil, but the legal battle currently heating up around their current home might make that happen sooner than later. Back in April 2017, it was made public that the Raiders were in default on their Coliseum lease thanks to hundreds of thousands in unpaid revenue from parking fees. The team had basically been making minimum payments since 2013 and owed around $25,000 more per game than they’d been forking over, which added up to $800,000. While the team disputed the amount, the Oakland-Alameda County Authority board threatened to kick the Raiders out of the stadium before the 2018 season if they didn’t make good. Cooler heads prevailed and both sides worked out a deal for the franchise to keep playing the Coliseum through at least this season and probably next season before moving on. However, now comes word of a multimillion-dollar antitrust lawsuit that the city of Oakland expects to file against the Raiders and the NFL, which has huge repercussions towards the relationship between the city, the stadium, and the football team and could result in the Raiders leaving town even before their Vegas stadium is ready to go. Per the San Francisco Chronicle, the Oakland City Council has authorized the lawsuit, which could be filed and announced as soon as Monday, when the Raiders open the season at the Coliseum against the Los Angeles Rams. The Raiders and the Oakland-Alameda County Coliseum are expected to approve their deal to keep the team there through the 2019-2020 season in a few weeks but, according to Oakland-Alameda County Coliseum Authority Executive Director Scott McKibben, team executives have told him that they will not sign any deal with the stadium if a suit is filed. “I think the mayor (Libby Schaaf) and the City Council really are just looking to justify themselves for not having done anything to retain the Warriors — and the A’s, for that matter,” Oakland-Alameda County Coliseum board member Ignacio De La Fuente told the Chronicle. While the details are unclear, the hope is not to force the Raiders to abandon their move to Las Vegas, which couldn’t be stopped at this point anyway, but to seek some form of financial damages from the league as a result of failed promises that will force Oakland to miss out on revenue once the franchise moves. Of course, the big question is, if the Raiders don’t return to the Coliseum next season but can’t play in Vegas until 2020 (at least), where will this NFL franchise play its home games in the interim? This was a topic of discussion in the early days after the team announced their intentions to move and all sorts of options were thrown out there, including the now-empty Qualcomm Stadium in San Diego, California Memorial Stadium in Berkeley, or splitting Levi’s Stadium with the 49ers in Santa Clara. As often happens with the Raiders, this one is going to get uglier before it gets better.